Home/IDC, News, Professional Diving Internships/Hosting the September 2015 PADI Instructor Examination! 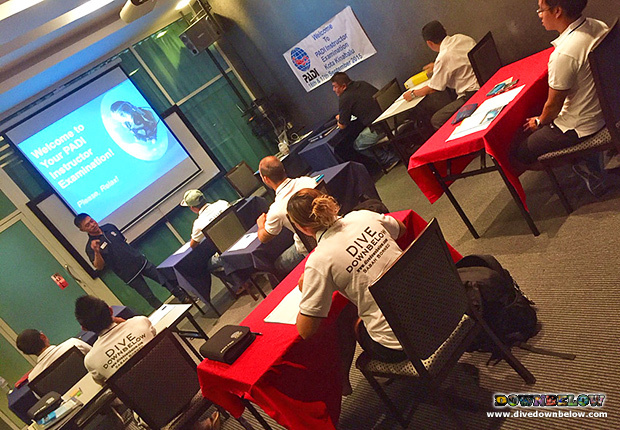 Once again, Downbelow Marine and Wildlife Adventures, are hosting the September 2015 PADI Instructor Examination (IE) in Kota Kinabalu! Downbelow’s reputation in professional scuba diving training is of a high standard because of a priority in diver safety and the 100% support of internship candidates too – and why our operations repeatedly host the Kota Kinabalu PADI IE! Our Go PRO team’s September 2015 PADI Instructor Development Course (IDC) has been no exception, with all candidates qualifying to enrol on the IE for the opportunity to certify as Open Water Scuba Instructors after the 2-day evaluation. Asia Pacific IE Examiner, MacGill Cheng, welcomes the candidates with an orientation on the first day before administering their dive theory, PADI Standards exams. The Downbelow team wish the very best to our 6 candidates: Alex, Leanne, Kelvin, Akmal, Oliver and Chris, who have worked so hard the past couple of weeks in preparation! Contact our Go PRO advisors about our next IDC in Sabah, Borneo, to Go PRO yourself!